Sonnet Software has appointed TACTRON ELEKTRONIK GmbH & Co. KG as their new sales and customer technical support representative for customers located in Germany, the Netherlands, Austria, France, Switzerland, and Denmark. 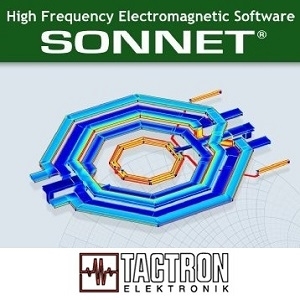 Sonnet has partnered with TACTRON ELEKTRONIK GmbH & Co. KG to provide exclusive sales distribution and technical support for Sonnet Suites high frequency 3D planar electromagnetic (EM) software products in northwest continental Europe. Starting immediately, Sonnet Software customers in the above territories may contact TACTRON ELEKTRONIK for sales and technical support requests. Contact information may be found on both the Sonnet Software and TACTRON ELEKTRONIK websites.